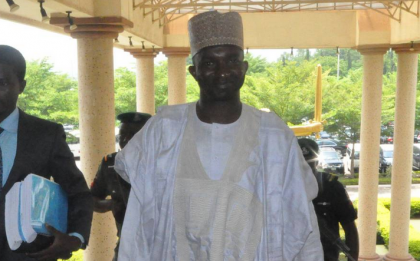 The Federal High Court, Abuja, has ordered the Economic and Financial Crimes Commission (EFCC) to deposit N12.5 million imposed on it for infringing on the fundamental human rights of Sen. Abdulaziz Nyako. Justice Gabriel Kolawale who made the order on Tuesday in Abuja, said that the fine should be deposited with the Chief Registrar of the court. The News Agency Nigeria (NAN) reports that the N12.5 million was imposed on the anti-graft agency as a fine for arresting and detaining the senator for three days. It was also imposed on the agency for freezing all of Nyako’s bank accounts for over two years without a court order, or charging him to court. The fine was part of the judgment delivered by the court on June 22, 2016 in favour of Nyako, who is a serving senator and son of former Adamawa governor, retired Rear Admiral Murtala Nyako. Delivering ruling on an application by EFCC for stay of execution of the judgment, Justice Kolawale struck out the application saying that it was lacking in merit. The judge said that no cogent reason was placed before the court to enable it use its discretion in favour of the anti-graft agency and stay the judgment. He disagreed with the argument of the EFCC that it would not be able to function if it paid the fine, adding that the argument was based on sentiments and not on law. The judge agreed with Nyako that the motion of appeal said to have been filed by the EFCC was a ploy to deny him the fruit of his success in his court case against the agency. Kolawale also agreed with the senator that his arrest and the freezing of his accounts for over two years was an abuse of his fundamental rights as a serving senator and a responsible citizen of the country. He added that the claim by the EFCC that the fine would hamper its performance was not tenable, because EFCC was adequately funded by the Federal Government. He ordered that the EFCC, should within 30 days, issue a bank draft in the sum of N12.5 million in the name of the Chief Registrar of the Federal High Court. “The registrar shall open an interest yielding account in a reputable bank of his choice with the draft,” Kolawale said. In the alternative, the court ordered the anti-graft agency to provide a bank guarantee of N12.5 million. He said that in the event that the EFCC failed to deposit the bank draft within 30 days, the respondents shall have the right to apply for garnishee order nisi. A garnishee order nisi is to allow Nyako withdraw directly from EFCC’s account with the Central Bank of Nigeria. The EFCC had in an application praying for stay of execution of the judgment, complained that it would not be able to undertake its statutory functions if the N12.5 million fine was paid to the senator. The anti-graft agency also informed the court that it had filed a notice of appeal in respect to the judgment of the Federal High Court. The agency said it would be in the interest of justice to delay the payment, pending the decision of the Court of Appeal on the issue. Earlier, the judge had berated the EFCC for claiming that the court issued a judicial fiat in respect to the judgment. The judge said that the EFCC as an organisation established by law, should learn to conduct its statutory functions within the ambits of the law. He decried the situation where security agencies rushed to magistrate courts to obtain detention warrants in matters where magistrate courts had no jurisdiction. The judge said that such habits amounted to “nothing but corruption” on its own. “In this extant case, EFCC cannot be said to be a diligent party having just filed a notice of appeal in a judgment delivered almost a year ago. “The EFCC should wake up and realise that the law that established it is not a cosmetic law but designed to protect the Nigerian citizens from acts of recklessness in the name of performing statutory functions. “It is a political slogan that a security agency cannot be subjected to court orders when it goes out of its way to infringe on the fundamental rights of the citizens. “The act of arresting and detaining before investigation is unconstitutional and bizarre and must not be condoned by any law court. “Remanding suspects through magistrate court orders in matters where magistrate courts have no jurisdiction is not only tragic but unfortunate. “This trend must be stopped, the security agencies must realise that Nigeria is now being governed through a democratic process,” the judge said. The Federal High Court had in 2016, ordered the EFCC to pay as damage the sum of N12.5 million to Nyako. The court also ordered that the EFCC should tender a public apology to Nyako for freezing his bank accounts and unlawfully detaining him for days without obtaining a court order.